Uber is making travel expensing easier on business people with a new partnership. The company has joined forces with Concur, which offers hotel and transportation booking and expensing software for seventy percent of Fortune 100 companies. 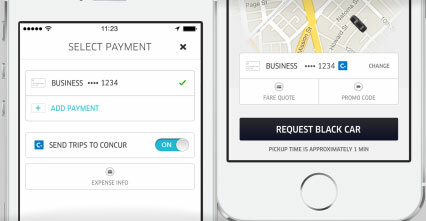 Uber passengers will be able to connect their Concur expensing app to their Uber trip while requesting their ride in the Uber app. A receipt will automatically populate in their Concur app, making it easier to track the expense. Uber spokesperson Lane Kasselman told Gigaom the integration works for all Uber products, including uberX and UberSUV. Concur is the belle of the sharing economy’s enterprise ball this week. Airbnb introduced its own integration on Monday with the business travel booking application. Concur will now show Airbnb options listed alongside the likes of more traditional hotels and hospitality choices. For both companies, the move into the business market was an inevitable expansion step. As Airbnb and Uber mature, they’re putting their hundreds of millions of dollars of venture funding to work forging into new markets and making a name for themselves as more than niche “sharing economy” alternatives to traditional taxi and hotel options. Concur has clearing had its eye on the sharing economy companies for some time. It wrote about the popularity of Airbnb back in April on the company blog. “Every year since 2010, Concur customers’ use of Airbnb has quadrupled, and is on track to hit $1 million in travel spend this quarter,” Lyndsey Patterson, senior social media manager, said in the post. “Granted, this is a small share of Concur’s over $50 billion in annually processed expense reports, but a quick look at the upward trend reveals that Airbnb is not far from reaching multiple percentage points.” In Tuesday’s press release, the company pointed out that Concur saw 27x the number of transactions for Airbnb this year compared to last. Concur, which is a public company with a $5.27 billion market cap, is a significant partnership for both startups, one that legitimizes their endeavors with a stodgier audience than the early adopter crowd.